This year we are bringing our programming to North Vancouver! We are partnering with Family Services of the North Shore and the North Shore Neighbourhood House to provide UBC Geering Up Camps in North Vancouver for the first time! Camps will be held at 113 E 3rd St, North Vancouver, BC (Community House of the North Shore Neighbourhood House). We avoid repeat activities that have occurred in the recent past to avoid kids experiencing the same camp year to year – so every summer, get ready for a brand new week of science and engineering! In our North Vancouver location we will be running one camp per week beginning July 8th, through to August 16th. Each week will be a different camp, so feel free to sign up for multiple weeks! Camps in North Vancouver focus on youth entering Grades 4 – 7. Grade 4 – 6 Maker camp focuses on the engineering design cycle. Be ready for innovative projects, fun challenges, and the opportunity to build to your minds desire! Imagineers is our grade 4-5 general science & engineering camp. 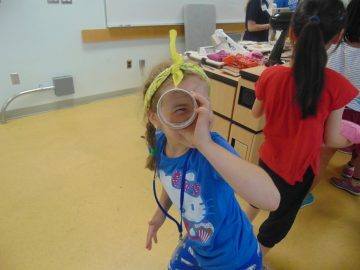 In the past, Imagineers activities have included a CSI-themed day full of the science behind crime scenes, building periscopes, a zip-line car design challenge, coding in Scratch, and building Lego Mindstorm robots. We are running two different (but equally fun!) versions of our Imagineers camp this year. Your child can now attend two weeks of Geering Up, with Imagineers A and Imagineers B! Grade 4 – 5 STEAM (Science, Technology, Engineering, Art, and Math)! This is a creative design camp. Join us at the crossroads of Art and Science, for a hands-on week of creativity and learning. This camp endeavors to show kids how principles of design and science are interwoven. Grade 6 – 7 STEAM (Science, Technology, Engineering, Art, and Math)! This is a creative design camp. Join us at the crossroads of Art and Science, for a hands-on week of creativity and learning. This camp endeavors to show kids how principles of design and science are interwoven.